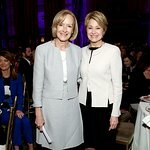 The Alliance for Women in Media Foundation (AWMF) is pleased to announce that Jane Pauley, journalist, author and anchor of ‘CBS Sunday Morning,’ will be honored with a Lifetime Achievement Award at the 42nd Annual Gracie Awards Luncheon. Award-winning “CBS Sunday Morning” journalist Martha Teichner will present Pauley with the award. Dylan Dreyer, weather anchor of NBC News’ “Weekend TODAY” and regular co-host for TODAY, will serve as host. This annual event, which honors the accomplishments of local and student women in media and entertainment, will take place on June 27, 2017 at Cipriani on 42nd in New York City. Pauley is an award-winning journalist and bestselling author. She was named anchor of ‘CBS Sunday Morning" in September 2016. She joined the program in 2014 as a contributor and has delivered newsmaking interviews including Condoleezza Rice, Hillary Rodham Clinton, and the only TV interview with David Letterman about his retirement from late night television. She’s also reported about a group of educators who lived through the shooting at Sandy Hook Elementary School in Newtown, Conn., now fighting to change gun control laws and an 11-year-old boy who became the voice of reason following the Ferguson, Mo. shooting. She began her network television career in 1976 as a co-host of NBC’s “Today” show. She spent 13 years on the morning broadcast, and a decade as the anchor of “Dateline NBC,” starting in 1992. She was the host of the syndicated daytime series, “The Jane Pauley Show” in 2004. Grammy-nominated songwriter Kara DioGuardi is slated to perform at the celebratory event. DioGuardi is one of the most successful contemporary songwriters in the world, with songs appearing on more than 160 million albums. A former judge on American Idol, the record EXECUTIVE and music publisher’s long list of credits include successes and collaborations with artists such as Pink, Katy Perry, Celine Dion, Kelly Clarkson, Britney Spears, Christina Aguilera, Miley Cyrus, Demi Lovato, Carrie Underwood, and many more. The Alliance for Women in Media thanks Broadcast Music, Inc. (BMI) for connecting The Gracies with empowering female musicians like Kara DioGuardi.